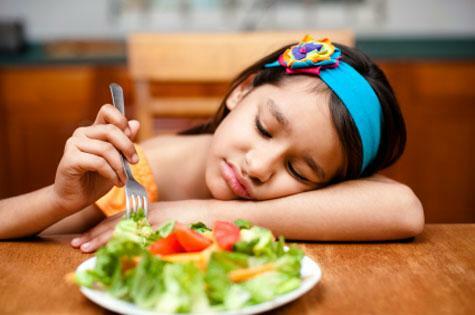 Most kids go through at least one phase of picky eating during childhood, and many go through a lot more than that. So what do you do when your child wants to eat chicken nuggets and pizza for every meal? What do you do when your infant has decided she’s done with baby food but doesn’t have enough teeth to chew much table food yet? Start by asking for tips from every parent you know. The collective wisdom of parents is phenomenal. I’ve picked up tips from friends, other mums at the playground, Yahoo chat groups, and books on feeding children. Some have worked for my kids and some haven’t, but I’m always willing to try if it will help me work more healthy foods into my child’s diet. One common tip is to get creative with food. I’d recommend First Meals, by Annabel Karmel, for some cute ideas on making food fun for your tots. She also includes great nutritional information and recipe ideas for kids from four months to five years old. Here is a random list of ideas I’ve picked up along the way that have helped me in those frustrating phases when the kids just don’t want to eat. · Pancakes are easy for little ones without teeth to gum. You can add applesauce, mashed banana, or pureed pumpkin to pancakes, along with a little cinnamon. · Cook and puree vegetables like zucchini or yellow squash and add them to spaghetti sauce. · Replace the oil or milk in quick breads or corn bread with baby food squash or sweet potatoes. You can’t taste it, and it actually makes the bread moister and lower in fat. · There are some great recipes out there for chocolate cake made with zucchini. The zucchini adds moisture but you don’t taste it. · Sprinkle grated cheese over eggs while scrambling them for some extra calcium and protein. You can also mix in some thawed frozen spinach or grated carrots if your kids will eat green and orange things. · If baby decides he doesn’t like yogurt, try the drinkable yogurts like Danimals. Just poke a straw through the foil and let him sip it. · Freeze cubes of condensed milk. These can be added to oatmeal or cream of wheat, or put in sippy cups to keep milk cold and add some extra calcium. · Try dipping sauces. My kids will eat just about anything if they can dip it in ketchup, mustard, or salad dressing. If none of these works, well, just remember that your child is probably just going through a phase, grit your teeth, and break out the chicken nuggets. God help me, I put aside a whole afeotnorn to figure this out.